Oh my my my. This is a good one. Really, seriously, you-won't-believe-it good. I almost always grab a stock pot and make a double recipe. In a dutch oven (or stock pot if you are doubling), saute, stirring constantly, butter, chopped onion, and chopped celery. In another pan combine 4 C boiling water with chicken bouillon granules. Add this liquid to dutch oven, along with can of chicken broth and hash browns (thawed, or nearly thawed). Simmer for 15 minutes. Next add grated carrot, Kosher salt, and pepper. Simmer another 15 minutes. Combine in a small bowl the flour and cooking liquid, stirring until smooth and slightly pasty. You may need to add a little more liquid. (You want it thick, not runny). I usually use the water from boiling my chicken as my cooking liquid. 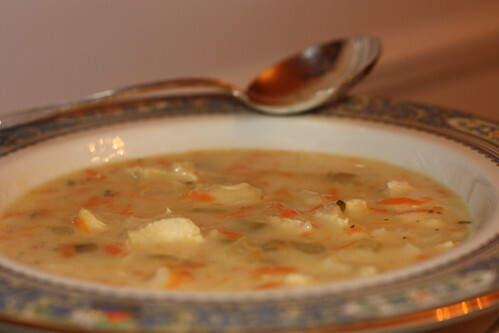 Stir the flour mixture into the soup pot, and stir constantly until soup is thickened and bubbly. Reduce heat and add sour cream, chopped parsley, and cooked chicken. Cook until thoroughly heated. 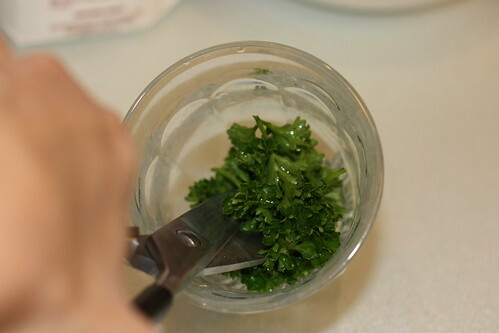 Sidebar: Easiest way to chop parsley (or any fresh herb)? Wash, cut stems off, place in small cup, and snip, snip, snip with your kitchen scissors. It adds a nice fresh flavor to this soup. Yields about 8 cups. Serve with fresh, hot buttered rolls. This soup can be your meal. I add chicken generously enough for the number of people I plan to feed, and everyone gets full! For more wonderful recipes, visit Rachel in the Land of Monkeys and Princesses. I'm a huge soup fan. I'm coming round for dinner. Right? Nap - I'm sick too. This tasted really good yesterday. Mo - Of course dude. Anytime you cross the pond! This really does sounds incredible. I love a good, hearty soup when the weather turns cold. I love fresh herbs and this soup.. nom nom nom. ifmom - I am the same. I wish I had more soups in my Favorite Recipes, because I do love them when it's cold. Rachel - Let's hope we're all over it by Christmas! What a DELICIOUS!!! combination of flavor, sound so YUMMY!!! and WARM!!! for a cold winters day. I found your blog through Rachel's! I can't wait to try your soup recipe! Super cute blog! OMG yum yum yum. Must make this! 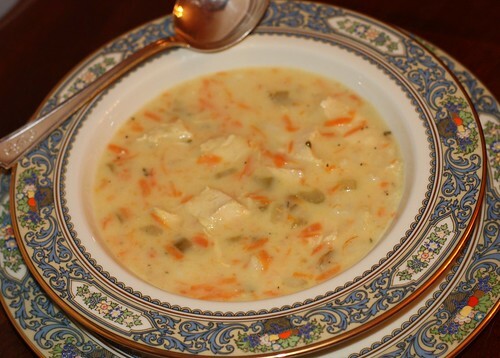 I love a good potato soup and this looks divine! Looks great. Thats my mom's fine china too. I've been saving this recipe on my reader ever since you posted it and now I've finally printed it out. Can't wait to give it a shot. It looks so yummy even on the screen!